It's a common question — should you use a softbox or umbrella to modify the light? I think the result of this test indicates that they are not radically different, but umbrellas may tend to have a bit more specular (hard) quality — look at the stronger relief on the right side of Nicole's face in frame 8 vs the softer look on the left side in frame 1. In this test I used the smaller softbox closer than the larger umbrella to roughly match their size in relation to Nicole's face (closer light sources usually soften the look). But there are many variables: sizes and types of diffusers for softboxes, sizes and types of reflector material in umbrellas make it difficult to generalize. Umbrellas are easier to transport, and with some you can shoot through the surface, which really makes it an open softbox. White umbrella material gives a softer effect than silver, but it all depends on subject, umbrella size, distance, and how close your light source is to the surface of the umbrella. Bottom Line: Softboxes are a bit softer; umbrellas have a bit more zing. All light from small softbox on left, with some fill from bouncing around the room, and off of the umbrella. 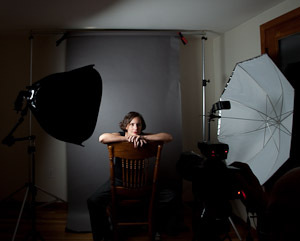 8 parts softbox to one part umbrella. 4 parts softbox to 1 part umbrella. 2 parts softbox to 1 part umbrella. 1 parts softbox to 2 parts umbrella. 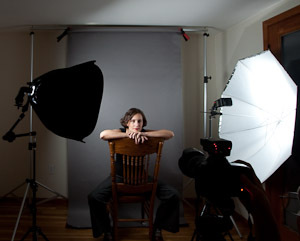 1 parts softbox to 4 parts umbrella. 1 parts softbox to 8 parts umbrella. All umbrella with some fill from white surface of the softbox on left.